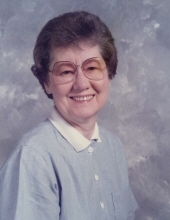 DURHAM: Hilda Vinson Chappell, 90, passed early Monday morning, January 28, 2019. A memorial service will be conducted Thursday at 11 a.m. at Mt Bethel Presbyterian Church, Durham. Inurnment will proceed the service in a small private ceremony. The family will receive friends before the service beginning at 10:00 a.m.
Hilda grew up in Smithfield, NC, and attended Smithfield High School. She attended Croft Business College in Durham, NC. Besides being a Presbyterian minister’s wife for many years, she worked as a secretary at American Tobacco Co. in Richmond, VA. Later, she was the first employee hired for Carolina Friends School in 1967 working there as head secretary until she retired in 1995. After retirement, she worked a while part time in bedding and bath at Hecht's Department Store. Hilda greatly enjoyed sewing and vegetable gardening and grew beautiful flowers in every space available. She also enjoyed reading books - reading about a book a day and sharing the books with others. She was a supporter of the Durham County Library and WUNC TV for many years. She was a loving wife and mother and was well liked by all who knew her. Hilda was dearly loved and will be greatly missed. Hilda is survived by her husband, William Henry Chappell of Brookdale Senior Living in Durham; her son, William Alan Chappell and wife Debbie Cobb Chappell, of Durham; and son, David Ryan Chappell of Durham; also, several nieces and a nephew. She was preceded in death by her parents, Lena and John Vinson of Smithfield; her sisters, Mildred Kinley, Chlore Wallace Glover, Patsy Coppage, and brother, Roland Vinson. In lieu of flowers, the family has requested memorials in Hilda’s honor to Habitat for Humanity, 215 N. Church St., Durham, NC 27701 or to the hospice of one’s choice. To send flowers or a remembrance gift to the family of Hilda Vinson Chappell, please visit our Tribute Store. "Email Address" would like to share the life celebration of Hilda Vinson Chappell. Click on the "link" to go to share a favorite memory or leave a condolence message for the family.